With the antiseptic, opaque prose of diplomatic hypocrisy, the US secretary of state officially turned a blind eye to the pending carnage its ally the UAE (United Arab Emirates) is preparing to unleash on Yemen, already the world's most serious humanitarian crisis. According to the UAE website, the UAE in Yemen is: "Facilitating a peaceful transition in Yemen and preventing extremist control." Translated, that means the UAE has intervened in the Yemeni civil war on the side of the deposed puppet government allied with Saudi Arabia. For its part, the US has participated in Saudi Arabia's genocidal air war on Yemen since 2015 and now offers no objection to a UAE-led military offensive to raise the death toll in ground combat. Unacceptable as international criminality has been in Yemen, it could be worse, since the US recently suggested adding more American forces on the ground to support the UAE current attack plans (US forces already fight in Saudi Arabia along the border and occasional combat missions elsewhere). "The United States is closely following developments in Hudaydah, Yemen," says Secretary of State Pompeo's official statement. Actually, the developments worth following involve the military advance of UAE troops on Hudaydah, which has been held relatively conflict-free since 2015 by the Houthi rebels, who control roughly the northwestern third of Yemen with two-thirds of the country's 27 million people. Hudaydah (also referred to as Al Hudaydah, Hodeidah, and other spellings) is Yemen's fourth largest city, with a population of about 400,000 on the Red Sea along Yemen's west coast. More importantly, Hudaydah is Yemen's second largest port (after Aden on the south coast) and is vital for supplying inland Yemen with food, medicine, and other necessities. The US-Saudi aggression first bombed Hudaydah in 2015 and closed the port with a US-Saudi naval blockade. The Houthi rebels have nothing that resembles a navy; Hudaydah's only significance is providing humanitarian aid. Even though the military stalemate of the past three years shows no sign of changing, there is much concern in recent days that the Saudi-coalition forces might somehow attack Hudaydah, even though they remain more than 50 miles away. The UN is actively trying to head off this "expected" attack, the UN Security Council has been "urgently meeting," and aid agencies have been evacuating staff, but the US has pretty much just shrugged. As Pompeo put it: "I have spoken with Emirati leaders and made clear our desire to address their security concerns while preserving the free flow of humanitarian aid and life-saving commercial imports." The UAE has NO meaningful security concerns in Hudaydah, and tangential security concerns derive from the UAE's criminal war against Yemen. The US can't possibly address UAE "security concerns" and keep the port open for "humanitarian aid and life-saving commercial imports," and of course Pompeo knows that, but it sounds good. And if there is an actual threat, where is it coming from? The UAE has apparently made quiet threats, with unofficial US backing, that even The New York Times treats as credible. Supposedly the UAE will use the distraction of the US/Korean summit as cover for its assault on Hudaydah. Reporting is sketchy and unreliable at best, but the Saudi coalition has been touting an attack on Hudaydah since mid-May. The UAE-led forces, numbering in the thousands perhaps, were then some 50 to 100 miles south of Hudaydah. Besides UAE troops, the force includes Yemeni government, tribal, and Sudanese units. They have reportedly made unspecified gains in recent weeks, and they have met resistance from Houthi forces, who control the territory between the ill-defined front and Hudaydah. That territory is densely populated with Houthi supporters, and any major offensive would likely kill many civilians (more than a million people live in the region). On June 10, the same news service (Reuters) reported Yemeni forces in places only six and 18 miles from Hudaydah, "local military sources said." Pro-Saudi coalition reporting is equally sketchy and unreliable, featuring gains by coalition forces west of Taiz, which is 154 miles south of Hudaydah. This report also claimed that a Houthi-launched missile was destroyed by the Saudi Royal Air Defense Forces, with no casualties resulting. The report went on to observe, without apparent irony, that: "Launching ballistic missiles towards densely populated cities and villages is in violation of international humanitarian law." Quite true, like the Saudi bombing of civilians almost daily since 2015. "This morning in Yemen, the Saudi-led coalition bombed a cholera treatment center. They have also just announced an imminent major military assault on the port of Hodeida. Aid groups like the United Nations have been given three days to leave the area. But there is no safety available for the 250,000 people who could die if this military operation is launched." "Hodeida is a key port that handles key imports of food, fuel and medicine. With more than 22 million people reliant on humanitarian aid and more than 8 million people one step away from famine, aid agencies have long warned of the humanitarian fall out of such an attack." "In light of your April 2017 remarks that the war must be resolved 'politically as soon as possible,' we urge you to use all tools at your disposal to dissuade the Saudi-led coalition from moving forward with this offensive and reject the provision of U.S. logistical, military and diplomatic support for any such operation." This is exactly what the US has refused to do for years. The US under President Obama took part in a political process that imposed a Yemeni government in the country that was unacceptable to the Houthis and the Yemeni majority, leading to a coup. This annoyed the US, since it disrupted the US use of Yemen as pretty much of a free fire zone for drone strikes. So the US green-lighted the illegal Saudi war on Yemen and made it possible with military support, including target choice, mid-air refueling, and a naval blockade. The US has consistently undermined any political peace process. 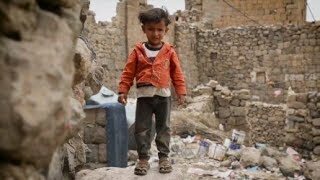 The US has participated in bombing humanitarian access to the Yemeni people. Now, under Trump, people are calling for the US to head off yet another potential atrocity of mass death at the hands of war criminals. Yes, it's the right thing to do, but it was the right thing to do in 2015 and then it would have been a much better thing and, possibly, even an effective thing.